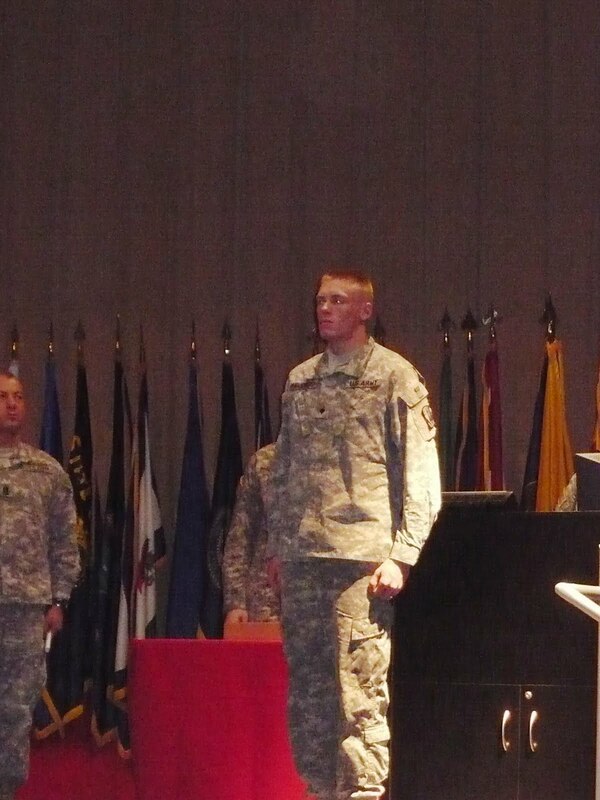 I don’t do a lot of family posting because this is primarily my art site, but I just had to share a few pics from my oldest sons NCO graduation! As a mom you worry, hope, dream, and countless other emotions for your children to become happy adults pursuing their dreams. Things aren’t always smooth sailing and your heart aches for them when things don’t go as planned. When my son entered the military a little over a year ago, he wanted to be in the Infantry, but due to a hip fracture during Basic Training his dream had to be put on hold and he was lead down a different path than the one he originally set out on. While the mom in me was relieved that he had a ‘safe’ job, it was hard to see him settle for something less than he signed on for. But, my son did not give up his dream. He’s worked hard and now has found a different path that will hopefully lead him to his original goal. He just finished his leadership training as one more step towards that goal. I was so proud to see him standing tall, happy with himself, taking charge of his destiny, and planning his life. He could have just settled, but he fought back and I’ve watched him turn into a man right before my vary eyes. Seeing him with his peers and all that they sacrifice and the pride with which they do it, should make us all proud as Americans. These young men and women give up much to serve our country and I’ve yet to meet one who doesn’t think the honors all theirs. I was reading an issue of Somerset that’s a few months old and found your article again on painitng eggplants…I set it up to use your technique to paint some flowers in my personal art journal. I’ve decided to take a little time off of from my art business…sort of burned out always creating ‘for sale’ art…anyway…I just popped over to your blog to see if there was anythinig else about painting and the collaging you do and saw this post about your son…how is he now and where will he be serving? My step son is in Iraq on his second tour. He is on a team who looks for and then dismantles IED’s…very dangerous work…so we worry about him a lot. The best to your son and I hope he goes all the way. I made it to SFC E-7 before retiring. Looks like you raised a good son. I know you are a great artist, but to raise a son who chooses to be a soldier, it's obvious that you're a great mom, too. 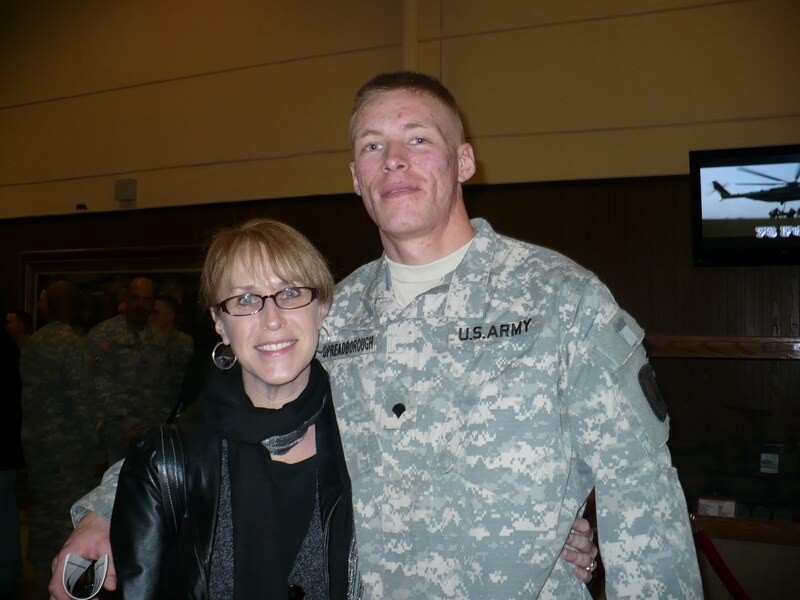 Congratulations to your son for pursuing his dream and a big thank you from me to him for serving our country.There are many choices in life and for those men and women who choose to serve our country I am humbled. It is a very admirable choice and I wish him success in his pursuit. God bless him, and you too, Pam…we are so grateful for his sacrifice and selfless acts to preserve our freedoms. How wonderful that he persevered when life threw him a curve….congrats to him. What a wonderful heartwarming post….and hey, guess what? My son just got his acceptance letter to his first choice college !! Woo Hoo…I guess it's the weekend for proud moms and awesome sons!! I am grateful for men like your son who are willing to serve our country…and I am also grateful for supportive parents such as yourself who stand behind these men.God bless all of you! ooo..pam. i know exactly how you feel. my oldest son josh joined the army national guard in his junior year of high school. he did his basic training that summer and right after his senior year. by the age of 20 he was storming buildings and looking for ied's. he was gone a year and 1/2 being a soldier. i always had this great inner sense of peace and just "knew" he'd come home. i know lots of soldiers weren't as fortunate. it takes a special person to be able to fight for our freedom and the freedom of others. god bless your son. i can see why you are so proud.